SPACE IS LIMITED – Due not delay, This is a BIG EVENT! This year, Oddmall is teaming up with the presenters of the Seattle Seafair Pirate Landing on Alki Beach. This be yer warnin’ shot! The cutthroat Seafair Pirates crew has made a deal with their new Captain Kidd and are comin’ to collect the bounty they left behind last year! Avast, the Seattle Seafair Pirates will sail in from the seven seas and the scallywags be stormin’ Alki Beach in West Seattle to kick off the 67th Seafair on Saturday June 25th, 2016. Don’t be gettin’ in their way! Merchants will be putting out their finest wares starting at around 10 a.m. and ye can shop, eat and dance along with the Pirates throughout the day! Including food vendors, toys, clothing, jewelry and art! The Seattle Seafair Pirates will land at Alki Beach around 2 pm. If they dare, the little buccaneers can try out the inflatable rides for the kids! Later in the day they can be part of a Pirate look-a-like contest to win some booty. Dress in your favorite pirate costume and meet us out on the beach – Ready, Aim, Fire! Vending opportunities are now available! On June 25, thousands of people will head toward Alki Beach in beautiful West Seattle to welcome the return of the Pirate Kings of the Northwest, The Seattle Seafair Pirates! This one-day festival attracts a wide demographic of local and visiting families from around the region to one of the most beautiful waterfront settings available in the city. The event is free for spectators and includes: live music, kid’s activities AND live “Pirate Play” demonstrations like bullwhip stunts, swordplay, and general swashbuckling with fully costumed characters. Oddmall is co-promoting this event with a production company called Monumental Undertaking (We also work with them to produce the Georgetown Carnival). If you would like to be a vendor at this event, Please follow these instructions to ensure proper placement in the Oddmall area, and to ensure Oddmall is credited for your signing up. 1. 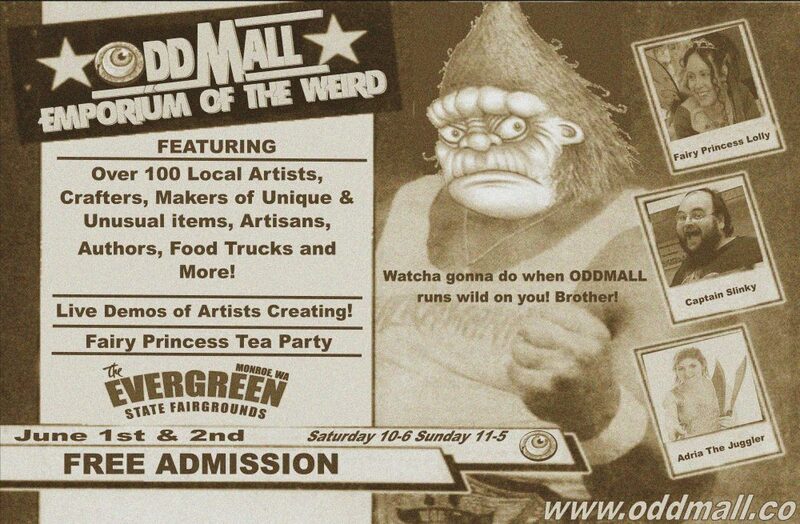 The registration form has a box that say’s did you hear about this event from ODDMALL. Select Yes! 2. Unlike other Oddmall events, You will be signing up directly with Monumental Undertakings. They do things a bit differently, all of the information can be found at the link below. 3. Upon Completion of your registration, please email a message with your booth name and web address toOddmallseattle@gmail.com stating that you have registered for the Alki event. We want to know who is coming so we can list them on our website too! Enjoy the day, and the over 10,000 people who come to this event.